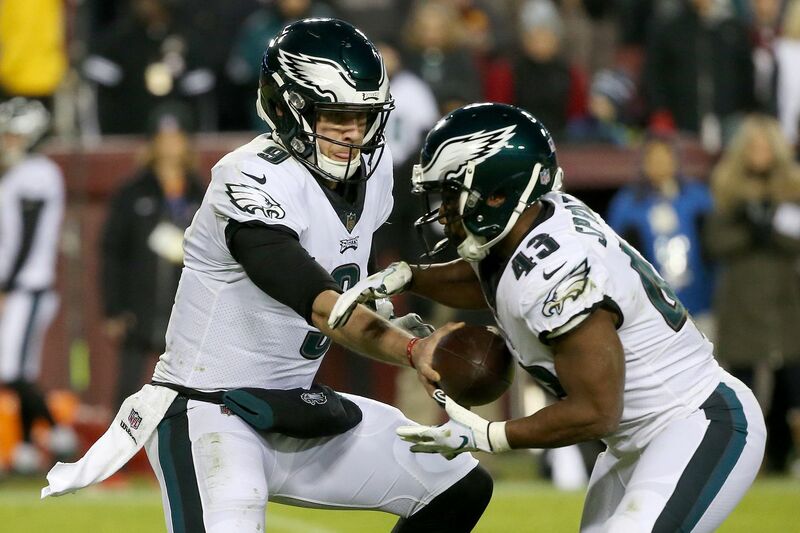 Eagles quarterback Nick Foles (9) hands the ball off to running back Darren Sproles (43) during a game against the Washington Redskins at FedEx Field in Landover, Md., on Sunday, Dec. 30, 2018. The Eagles got a solid performance from their defense and enough from their offense to give themselves a chance at the playoffs. Here’s who is trending up following the Eagles' 24-0 win to finish the regular season 9-7. UP – He deserved as much blame as anyone for the Eagles' 4-6 start. But Pederson kept the team together, improved his play-calling and game managing, and led his team on a 5-1 finish. The Eagles are back in the playoffs and there aren’t many teams that want to see them. UP – Pederson may send Matt Nagy a bottle of the good stuff after the Bears beat the Vikings and knocked them out of the playoffs. But his affection for his former colleague will be short lived. The Eagles head to Chicago next weekend for a first-round showdown. UP – He’s been good for one bad interception a game since taking over at quarterback. But Foles has otherwise been near perfect in three games. On Sunday, he tied an NFL mark for consecutive completions with 25. He left with a chest injury, so the magic may have run out. Eagles Nation holds its collective breath. Could Carson Wentz be healthy enough to play next week? UP – The Foles-Jeffery magic is a real thing. Their chemistry has been a major reason for the Eagles' late-season success. Jeffery converted an early third down with an over-the-shoulder grab and scored the first touchdown by out-muscling a Redskins defender. UP – The big guys up front controlled the Redskins d-line. Eagles running backs seemingly had a yard or two on each carry before contact. And Foles had more than enough time on most throws. Left tackle Jason Peters and center Jason Kelce deserve special mention for playing through injury. UP – The Redskins were severely shorthanded on offense. Their best passer was punter Tress Way. Quarterback Josh Johnson, in his defense, had few receiving options. But Schwartz’s crew dominated Washington and pitched their only shutout of the season. UP -- He finished with double-digit sacks after taking Johnson down three times Sunday. But numbers don’t tell the full story of Cox’s greatness. He’s one of the best defensive players in the NFL and he’s entering into the pantheon of the Eagles' greatest. UP – The linebacker was another Eagle playing through injury late in the season. But he didn’t allow a broken thumb to restrict his play in coverage. Bradham batted an early third down pass at the line and broke up another down the field in the second half. UP – When Foles left, Sudfeld jumped in again, but this time he led the Eagles to seven points and his first career touchdown pass. UP – It didn’t take long for the Eagles cornerback to make his presence felt. On the first play from scrimmage, Johnson threw downfield, but Douglas came over for the interception -- his third on the season. UP – Last week, he scored his first touchdown in 13 games. But Agholor didn’t want to experience another dry spell and reached the end zone twice against the Redskins. UP – Bennett has been the Eagles' most consistent defensive end this season. The 33-year-old was a hell-raiser all game and notched his ninth sack of the season in the fourth quarter. UP – Pederson never gave up fully on Smallwood. It’s a good thing after all the injuries at running back. Smallwood has always been a tough runner, but he several impressive extra efforts on runs and passes.